New York rapper Nas has joined forces with Bob Marley's youngest son, Damian to produce this absolutely amazing album, Distant Relatives. 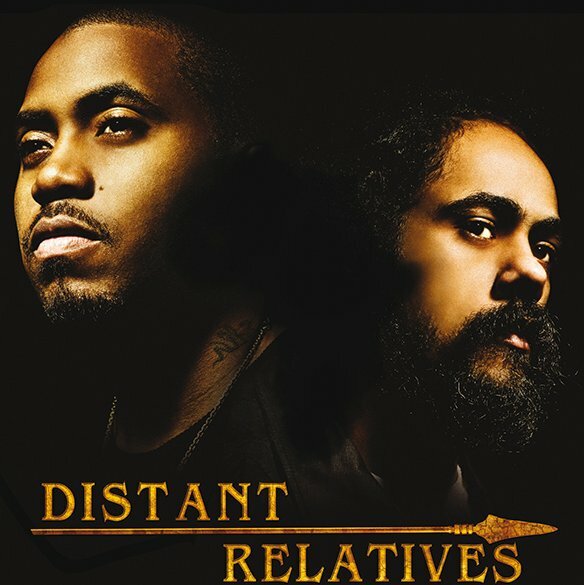 It follows the same style as Damian Marley's grammy award winning album, Welcome to Jamrock but with a heavy presence from Nas. It follows themes of ancestry, poverty and ties to Africa delivered with a fusion of hip hop and reggae. It's nothing like most of Nas' previous work centred around guns and gangster raps but more about positive themes like, family, friendship, leadership and African history and culture. Like I already said, this is an amazing album that you must check out. The lyrics aren't too preachy and the beats on the tracks are phenomenal at times. If you liked Welcome To Jamrock you'll like this... If you don't like Nas you'll still like this... and if you like this, check out Welcome To Jamrock!!! This is one of the albums of the year for me.